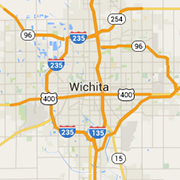 Looking for insurance in Wichita? Choose from these auto, homeowners, life and business insurance providers. Our number one goal is to make insurance simple. We take pride in educating our client/members so you're able to make wise decisions. Se Habla Espanol! - Our team is here to serve you, Whether your looking for auto, home, health, life, business, or farm & ranch insurance, we have you covered. As a resident and agent of Wichita since 1986, I strive to help my clients manage their everyday risks, recover from the unexpected, and realize their dreams. A dream is the most valuable thing you will ever own. Let me, Ryan Woods, with American Family Insurance help protect your dream. With over 4 years of experience as an American Family Insurance agent, I believe in providing dependable protection as well as outstanding customer service. Focusing on auto, home, life, health, and banking; all of us at Andre Hale State Farm look forward to earning your business! Farmers® agent in Wichita, KS, my goal is to help customers like you identify the insurance coverage that best fits your needs. Our team of fifteen, has over 60 years of combined experience serving our clients. We are a husband and wife team working together to make our dreams happen by protecting yours.